Last time I posted about formal teaching observations I mentioned the importance of time limits and signals. I'd like to go into a little bit more detail about time limits. Let me start with a story. I worked in a "full inclusion" school district. That means that all students, regardless of their abilities or disabilities, attended most of their classes with their same-age peers. The regular educator was responsible for differentiating the work for all students. They might receive assistance or suggestions from special education teachers but the classes were not co-taught. The regular educator was the only adult in the room most days and the classes included students on the entire range from gifted to severely disabled. Full inclusion has its challenges for sure. But you do learn to differentiate! One year I had a student named Eric, who was on the high functioning end of the autism spectrum. He really struggled with anxiety when teachers would give him a large chunk of work to do like 10 questions on the same page. And it was also hard for him to stop working on one thing and transition to another. 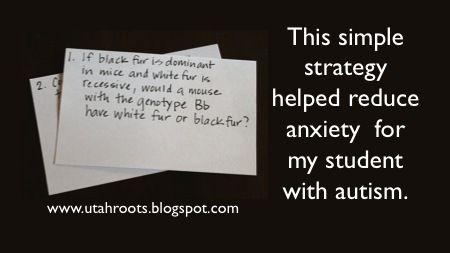 A large part of his anxiety was related to timing. It upset him to see a lot of questions or problems all at once. It seemed overwhelming to him and he had trouble with determining how much time to spend on any one question. And then he was annoyed when a teacher would tell him to stop working and transition to something else, especially if he had just one more thing to do and was being told to stop working on it. In an effort to ease his anxiety I did a couple of things. I started giving him smaller chunks of work. Instead of giving him ten questions on one sheet of paper, I'd give him one question on an index card and I would tell him how much time he had to finish it. Then, I'd collect that card and give him the next card, and so on. It worked well for both of us. He never saw the work he didn't get done so he wasn't upset about it, and he didn't resist working when it was one thing at a time. He often would say "I can do that" when I gave him one card. And then he'd say it again when I'd give him the next one. It was like he was reassuring himself. And he got a lot more work done too! Another thing I did was to give him a heads-up when his time for any task was coming to an end, so that he was never taken by surprise by a request to stop working. But he did NOT like it when I came to his desk to give him that warning. He felt singled out. So I started announcing to the whole class "In two minutes, I'm going to ask you to start cleaning up." That gave Eric the warning he needed, but without singling him out. I was pretty surprised when that advance warning worked just as well for the rest of my students as it did for Eric. They all did a better job of transitioning to another activity when I had given them the two minute warning before asking them to stop what they were doing. So that's how I learned first hand about the value of time limits at the beginning and the end of a task. When you're being observed, you really want transitions to be smooth because then you don't lose much instructional time, which is something the administrator is attending to. Believe me, they're counting how many minutes it takes you and the kids to transition to the next activity. Of course I'm sure you would like to be more efficient with time whether or not there's an administrator observing you. One thing there's NEVER too much of in teaching, is time! One weird little additional tip: Don't use time chunks like five minutes, or ten minutes etc. Time chunks like those seem flexible not rigid. They don't cause students to pace themselves. It sounds strange but it's true. If instead, you say "You have until 9:07" kids will do a better job of watching the clock and pacing themselves. But stick to it. At 9:07 it's time to stop. It takes some practice but students will learn that you mean it when you say 9:07. And do give them a heads up when work time is coming to an end. Don't spring it on them. Tell them "You have three more minutes to work" (another irregular time block) and then when you do tell them to stop, they'll be more likely to have finished their task and be ready to move on. It used to drive me crazy when I'd have seven groups of students ready to move on and one group still rushing to finish and clean up. That problem pretty much went away when I started using time limits more effectively. Thank you so much Karen! It's great to see you here and it makes me really happy that you can use the cards strategy right away! For Eric, it made the difference between being too anxious to get anything done, and being able to tackle a task. And it gave me the flexibility to respond appropriately when I could see that he was approaching his limit on what he could do that day. Then I could just stop giving him more cards, and he never felt that there was work left unfinished. Win-win for both of us!